Pushing back from the table is the best part of a meal with friends. That’s when the really good conversation comes out. That’s when you really start exploring deeper subjects, family histories, personal tragedies, and more. We’ve had our fill of a good meal. We’ve had our formal, meal-time gathering. The dishes have been passed, the plates have been filled–and emptied. Our stomachs are full. Bring out the coffee–and maybe some desert. … Let’s push back from the table a bit … and talk. But what if there was no table from which to push back? No firm structure on which to place your hands in order push back your chair? What if there was no meal by which you filled your stomach. No formal feast around which your gathering is organized. What if it was just an empty circle of chairs? Maybe the bowls of food were on the floor or off to the side of the chairs. Maybe each person just held their plates in their laps. Or, what if the table was there but it fell apart as soon you put any weight or pressure on it? Feel …. uncertain? Feel … unstable? Maybe even a little chaotic? Empty? It’d be hard to enjoy pushing back from the table if there were no table or if it was a rickety thing. We need that firm structure. We need that solid surface so we have something to put our food on, something to rest our elbows on, and…something to put our hands on when we’re ready to push back for the really good conversation. We all want our kids (and adults) in the church to push back from the table and get into that really good conversation. But, I wonder if many of us are forgetting to set the table…or even have a table at all. I wonder if the reason that so many in the church feel so lost and uncertain as they try to engage the culture in meaningful conversation is that they never really had a table–a theological table–built or set for them from which they could push back. I wonder if we’re wanting that really great discussion–that “push back from the table” kind of conversation–about God, faith, the Bible, and the cultural issues we’re facing today so badly that we skip the meal and forget to set the table…lay the foundation…instruct our students according to a “pattern of sound teaching” (Romans 6:17). I know I’ve been guilty of that over the years. For so long, I would bounce around from topic to topic in my teaching. I would try to find subjects that were interesting to the kids or topics that seemed relevant to the cultural issues of the day. Looking back, I realize that I did not build a strong table around which my students could gather for learning or on which I could place the meat and potatoes of “wholesome teaching” (2 Timothy 1:13). I wonder if there are others out there doing the same? These days, I’ve come to really like using Covenant Catechism through its resources titled “Rock Solid” and “The Journey: OT” and “The Journey: NT” as a means of building that table and setting it with the meat and potatoes…a means of “instruct[ing]” students “in the way of the Lord” (Acts 18:25). These resources use a different metaphor in the idea of going on a journey and establishing firm footholds. An adventurous journey is obviously a much more youth friendly metaphor than a dining room table. But, for this conversation, I’d like to stick with my metaphor of the table. “Rock Solid” is a course developed by the Evangelical Covenant Church built around the 26 “Building Blocks” of the Covenant Catechism (the Greek word katecheo means “instruct”) establishing a firm foundation for faith. In this resource, “Building Blocks” are called “Footholds” Each lesson includes as it’s “Foothold” 1) a Question, 2) an Answer, and 3) a Biblical Text. For example: “Who is God? God is personal, eternal Spirit, Creator of the universe, Father of our Lord Jesus Christ and our Father.” Psalm 90:1-2 “Lord, you have been our dwelling place throughout all generations. Before the mountains were born or you brought forth the whole world, from everlasting to everlasting you are God.” Each lesson also includes several other biblical passages for teaching reference, a suggested opening activity, and a curriculum for exploring connections with the head, the heart, and the hands. It also has an accompanying daily devotional/journal for students to use at home. 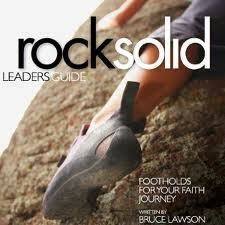 Although Rock Solid is based on the Covenant Catechism, it is not bound by denominational distinctives. The Covenant Catechism is very broad in its orthodoxy and centrist in its biblical orientation. It could be used in just about any protestant church. We use Rock Solid with our 6th graders on Sunday mornings. Although, it can be used for any age group. Each week, we write the Building Block on a white board in front of the class. The question goes on top. The answer goes below it. Then, after a few minutes of opening conversation (highs and lows, exciting news, etc.) we open with a fun attention-getting activity or object lesson that is either found in the Rock Solid lesson plan, another resource book, or is made up by the teacher. Then the teacher reads the question and invites the kids to turn to the various biblical passages in the day’s lesson, taking turns to read through them. As they read, the teacher explains various terms and concepts mentioned in those texts. Inevitably, kids also ask questions which is great because it affirms and inspires their own formative exploration of the Bible. Then, the teacher reads through the answer to the question on the white board. After each term or phrase, the students are invited to explain or define them in their own words and the teacher helps with examples, or illustrations. Again, the kids ask lots of their own questions because their inquisitive minds are really working by this point in the lesson. Finally, the class practices reciting the answer over and over. After each time it’s recited, though, students take turns erasing one or two words/phrases from the board. Eventually, there is no writing left on the board and the class is reciting the answer by memory. Of course, this isn’t the only way to do memory work but it’s one that works for us. By the way, they love it when the teacher provides some type of reward or treat for the memory work they’ve just done as a group and as individuals. I think the kids really like the class. It’s especially effective if the opening activity is fun and engaging and if the teacher has a fun personality and is good at handling spontaneous questions. But our “pattern of sound teaching” doesn’t end with the 6th graders. I consider that year to be the year we build the table…give their faith some structure. After that, we set the table with the meat and potatoes of the Word itself. The 7th graders spend a school year in the life of Jesus using the “Christ” curriculum from Student Life Bible Study (now owned by NavPress). But we supplement each week’s lesson with a connection to one of the Footholds and another recitation of it to work it into memory. This course also includes a daily devotional/journal for students to take home. The 8th graders spend a school year in the world of the Old Testament using “The Journey: Old Testament” as the first year of Confirmation. Half of the Footholds of the Covenant Catechism are, again, attached to various lessons throughout the year. And, again, the students use the provided daily devotional/journal as part of their personal formation. Finally, the 9th graders spend a school year in the world of the New Testament using “The Journey: New Testament & Beyond,” as the second year of Confirmation. Again, the remaining Footholds are attached to various lessons through the year and each student gets a daily devotional/journal to take home. By the time students complete their 9th grade year, many of them will have 1) gone through the Covenant Catechism three times in different ages and biblical contexts and 2) studied through all four Gospels, the life of Christ, the entire Old Testament, and the entire New Testament. This, to me, seems like a Rock Solid table on which students can feast on the Word of God. There is repetition. There are concrete statements to learn. And there’s an orderly “pattern of sound teaching.” After all this feasting around such a firm foundation, they’re ready to push back from that table and engage in some really meaningful conversation. Because they know who God is, what sin is, what the kingdom of God is, what salvation is, etc. They’ve gained a good frame of reference and a real vocabulary with which to have deeper, more meaningful conversations. But, of course…we all know…the next big meal is just a few hours away. Right? It usually isn’t long before it’s time to set the table again. In other words, there’s more feasting to be had on the Word of God. It doesn’t end in 9th grade and it doesn’t end with a catechism or confirmation…thankfully. Because those times of feasting and pushing back from the table for some really great conversation are some of the best moments in life.